With a history spanning 4,500 years, Stonehenge has many different meanings to people today. 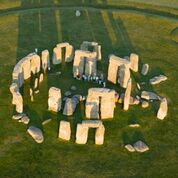 It is one of the Wonders of the World, the best-known pre-historic monument in Europe, and a spiritual place. Booking in advance is the only way to guarantee admission on the day of your choice, and includes the shuttle to the stones, the world-class exhibition and Visitor Centre. Delivery options: please select 'free collection from store' at check-out, and we will email the voucher to you. Remember to take your voucher with you (not the booking confirmation). be Without your voucher, you will not admitted. On arrival at Stonehenge, go to the Admission Desk where staff will exchange your voucher for actual tickets. Last admission to Stonehenge is 2 hours before the advertised closing time. The voucher is for admission only; it does not include any transportation to Stonehenge.